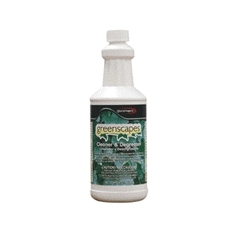 Greenscape Cleaner/Degreaser is a heavy duty cleaner and degreaser. Recognized under the EPA Design for the Environment (DfE) Formulator Program. Use as is for tough cleaning or may be diluted up to 64:1 for light duty cleaning. Contains biodegragable surfactants and degreasers.For use on walls, floors, tile, vinyl upholstery, metal, porcelain, concrete, and counter tops. Removes grease, oil, grime, soap scum, lipstick,wax, food stains and dirt. Use on whitewalls to restore original color. WALLS: Use as is or dilute up to 1:12 and spray on holding sponge underneath. On larger areas, clean from bottom up. WAX REMOVAL: Use as is or mix 1:10 with cold water. Apply to floor generously. Wait 5 minutes. Scrub with nylon pad or scrub brush. VINYL UPHOLSTERY: Use as is. Spray on. After 2 minutes wipe with sponge. DEGREASING: Use as is or mix up to 1:64 and apply. Allow 4 minutes for penetration. Wash with hose or power sprayer.